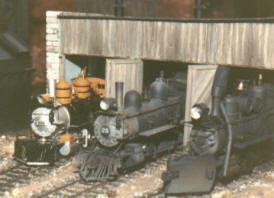 Sierra Scale Models (SSM) provides information, supplies, and photos related to model railroad scenery and structures. Learn techniques for building model train layouts, applying cedar shingles, constructing wood log cars, painting backgrounds, installing scale glass, making molds, and weathering structures. The SSM Articles provide tips and techniques that are relevant for all railroad scales, including N, HO, S, O, G, and narrow gauge. The SSM Gallery includes photographs of some of the most famous steam railroads in the world. Our SSM Products include realistic scale glass, weathering powders, cedar shingles, sawmill wood, lightning kits, stacks of rough lumber, log loads with chain, sound cams, chain link fences, snow fences, logcar kits, natural wood stumps, and scale turf. They reflect 40 years' experience in model railroading, and have been instrumental in numerous awards, including Master Model Railroad designation by the NMRA. Nickel plating service is also available. Have you ever wondered what your brass locomotive is worth, or what it would cost you to start a brass collection? Our Brass Sales section reports recent prices from eBay and other sources to provide up to date values for geared and logging locomotives, such as Shay, Climax, Heisler, Willamette, Dunkirk, and Vulcan. A shopping cart has recently been added to the website, and all major credit card and PayPal payments are now accepted. If you would rather pay via check or money order, simply send an e-mail message to Dave. Sierra Scale Models is proud to represent the growing line of Bosco figures by Keith Glaab, which capture the essence of John Allen's famous Gorre & Daphetid figures. Sierra Scale Models is owned and operated by Dave Barron, an NMRA Master Model Railroader. If you have questions about the products, send a message to David Barron or call 407-217-7148.